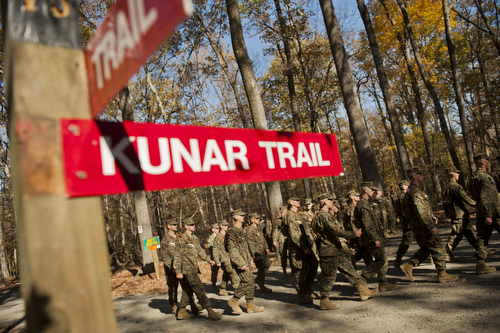 MARINE CORPS BASE QUANTICO, Va. – Officer candidates will now be training and running on trails named for some of the hardest battles fought by Marines during the recent conflicts in Iraq and Afghanistan. Col. Kris Stillings, commanding officer at Officer Candidates School, led a ceremony today here at Marine Corps Base Quantico, Va. 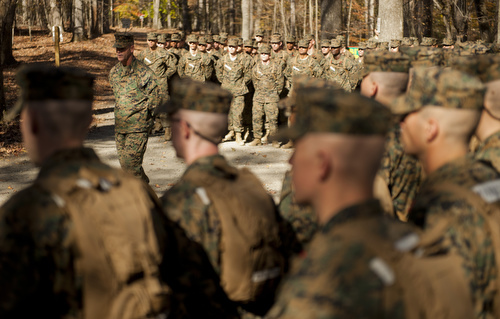 He stood with officer candidates lined up in formation at the newly named intersection of Fallujah and Kunar trails. Sangin Trail, the third to be named, runs slightly to the north. Navy Cross recipient Capt. Ademola Fabayo was the guest of honor. Stillings said he was there to represent Marine Corps history, since the event was about more than just the naming of trails. Fabayo was presented with the nation’s second highest valor award in June 2011 for his actions in Kunar province, Afghanistan. Fabayo was credited with extraordinary heroism during the Battle of Ganjgal – the same that earned former Cpl. Dakota Meyer the Medal of Honor. As previously reported, then 1st Lt. Fabayo and other members of Marine Embedded Training Team 2-8, out of Okinawa Japan, were ambushed Sept. 8, 2009, in the village near the Pakistan border. Fabayo repeatedly braved enemy fire on foot in order to reestablish connection with Marines and a corpsman at the front of the patrol. Later, he took the gunner’s position in a vehicle and reentered the kill zone to help recover the bodies of missing Marines. Fabayo then told the candidates that any of them are capable of demonstrating the same type of leadership in the future. The key, he told them, was to pay attention to Marine Corps history. Stillings said his operations officer, Maj. Adam Jeppe, approached him with the idea of naming some of the trails for recent battles a few months ago. Since Marines have been involved in many important areas in Iraq and Afghanistan, deciding on the names took some deliberation, he said. The candidates at OCS learn about historic battles, and they decided to include Kunar province and Sangin district in Afghanistan and Fallujah, Iraq. Candidates Michael Choate, Alicia Peterson and Sky Colvil are all prior enlisted service members who served in the three areas of Iraq and Afghanistan that were honored today. They called the captain’s presence there motivating. 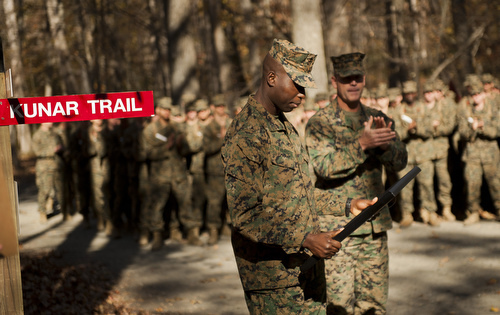 Seeing a trail named for Fallujah brought back a lot of memories for Colvil, an officer candidate who served there as a Navy corpsman. As someone who hopes to lead Marines in the future, he took Fabayo’s message to heart. Stay tuned for more from exclusive interviews with Stillings and Fabayo. You are correct — thanks for pointing that out. I made the fix. This makes me proud. Although 2/7’s ’08 fight seems forgotten by most, the men who gave their lives there will be remembered through these battles and something as small as a trail being named after Sangin makes me proud to know those who departed us there.